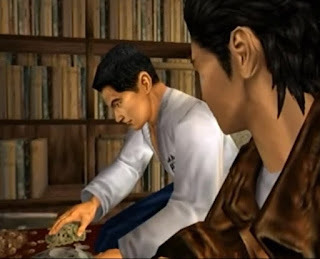 Shenmue shows its sense of humor in scenes like this one where Fukuhara-san counts the money from his piggy bank to give to Ryo. Literally only a few seconds after he begins counting the coins that have spilled out of the smashed piggy bank onto the table, the camera pans down to reveal neat piles of coins and he announces the total amount. The sheer speed at which Fuku-san completes the task suggests he has hidden talents far removed from the world of martial arts - his calling may well be in finance. How on earth did you sort all those coins so quickly, Fuku-san? And furthermore, Ryo expresses no surprise at this incredible feat (as usual, in keeping with his character). Are you a fan of the character of Fukuhara-san? He rarely gets things right, but he's so well-meaning it's hard to dislike him. I like Fukuhara-San, He tries his best. I'm with you on that. He's like a kid that has never really grown up!